Heat oven to 375°F. Spray 13x9­-inch (3-­quart) glass baking dish with cooking spray. In small bowl, mix enchilada sauce and salsa; reserve 1/4 cup of the mixture. In large bowl, mix remaining enchilada sauce mixture, the chicken, sour cream, 1/4 cup of the green onions and the taco seasoning mix. Spoon reserved 1/4 cup reserved enchilada sauce in bottom of baking dish. Arrange 8 tortilla pieces over sauce, overlapping as necessary. Spoon half of the chicken mixture over tortillas; sprinkle with 2/3 cup of the cheese. Repeat layers. Cover with foil. Bake 30 to 35 minutes or until hot. 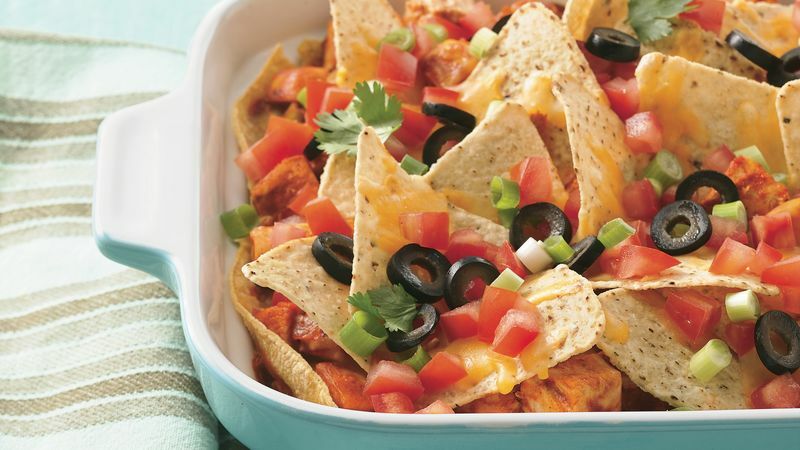 Layer tortilla chips, tomato, olives, remaining 1/4 cup green onions and remaining 2/3 cup cheese over top of casserole. Bake uncovered 5 minutes longer. Let stand 10 minutes before serving. Garnish with cilantro leaves. This casserole also tastes great when prepared with 1 lb cooked ground beef instead of the chicken. Cutting the 8 tortillas in half is a snap when you use a kitchen scissors.